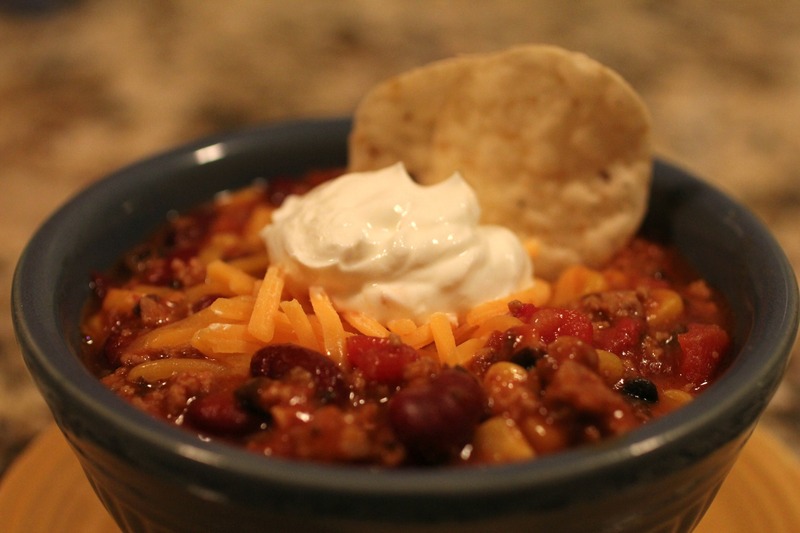 Have you ever had taco soup? I never had until tonight. I mean, I like tacos, and I like soup, so it seemed like a pretty solid bet that I would like it. Well, it was a hit! My husband stinkin’ loves anything Mexican-y for dinner so he was giddy when I told him what we’d be having. This dish has a lot going for it. In addition to being delicious, it’s also healthy, RRREEEALLY easy, and only uses one pot (yay for no dirty dishes)!! This recipe has about 265 calories per cup, which is great for something so hearty and filling! Of course, I added shredded cheese and sour cream which definitely increases that calorie count, but oh well. I live on the edge, man. Anyways, this is a GREAT weeknight dinner, especially when you need something warm to take off the winter chill. It only takes about 5 minutes to prepare and another 20 to cook. The only thing I would do differently is add a second packet of taco seasoning. Mine turned out tasting a little bit more like chili than it did a taco so I’d like to increase that taco flavor. Brown the ground turkey meat in a large pot. Bring to a boil and then reduce heat to low. Let simmer for about 20 minutes. Top with optional sour cream and shredded cheese. In addition to the recipe above, I added cilantro,frozen corn kernels, and black beans to the pot and topped it with a few slices of avacado.. yumm! Mmmm! That sounds really good, Janna! I thought about adding cilantro, but I didn’t have any on hand. This sounds delicious and super easy! Must try! I hope you do! And it is both delicious and SUPER easy! 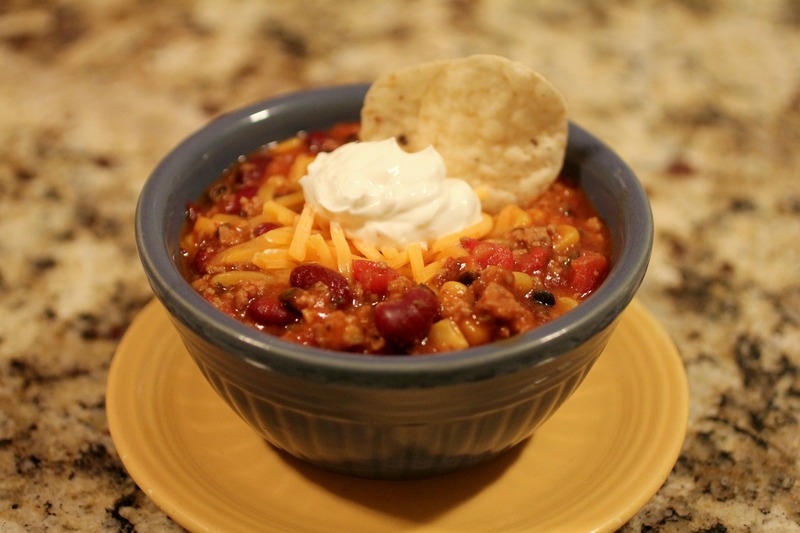 I have never thought of taco soup, incredible!! Thanks Judy! This was my first time to have taco soup too, and I gotta say, I think I’m hooked! I’m going to try this over the weekend, can’t wait it sounds great! I’ll let you know how it goes. My husband is very excited! Thanks Christine! Hope you and your hubby like it! This sounded good, but I changed it some I sauteed about 1/2 cup of onion and 1 1/2 tsp. minced garlic in butter. Browned ground beef with the onion/garlic. Drained it well. Fixed the soup per your recipe. Added about two tbsp cayenne pepper sauce. Topped with cheese and served with tortilla chips. Mighty fine.